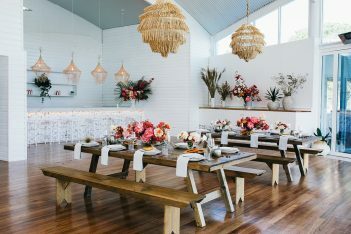 Ancora Tweed Heads is one of the newest wedding venues on the Tweed Coast, situated on the Tweed River in Tweed Heads, minutes from famous Gold Coast beaches, Snapper Rocks and Rainbow Bay. Water views like no other Tweed Coast Wedding venue, Ancora is a unique and picturesque wedding venue. Whether you are after an indoor ceremony location or an outdoor ceremony location, Ancora has you covered, with a sheltered open air ceremony location and riverside garden area. Inside the Ancora reception venue filled with natural light, you can expect high ceilings, hardwood timber flooring, crisp white-panelled walls and floor-to-ceiling glass windows overlooking the water. Wedding planning is easy at Ancora, with all-inclusive venue packages offering white European bentwood chairs, hand-crafted wooden dining tables and state of the art lighting and AV systems. 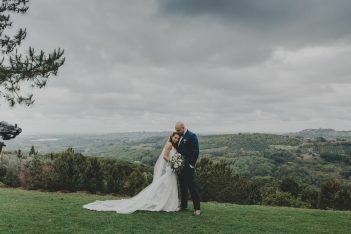 A dedicated function manager and professional wedding team are also on-hand to service your day seamlessly from start to finish, allowing you to truly relax and enjoy every moment of your celebration. Choose from a Greek inspired menu from the award winning restaurant Taverna in Kingscliff. Packed with distinct Mediterranean flavours and with a focus on share style dining, the gourmet menu options include locally sourced seafood, slow cooked lamb and Taverna’s famous Byron Bay haloumi. 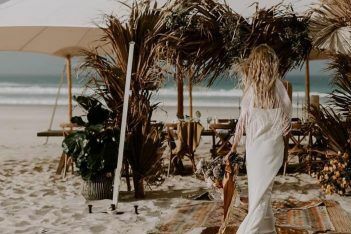 Stunning wedding photo locations, right on Ancora’s doorstep, including Coolangatta beaches, Fingal headland and secluded private islands with lush greenery, Ancora is the perfect waterside wedding venue.